1. You can publish from every account in one place. Facebook, Twitter, LinkedIn, and now Google+ is supported by Social Inbox! Finally. This is so much easier than having a million browser tabs open and having to remember a ton of passwords. Plus you can schedule multiple tweets or posts at one time, all within one box. It even gives you hints to make your posts more visible, such as adding a hashtag on Twitter or adding a picture to a Facebook post. You can also attach your social media posts to a specific campaign. 2. Did I mention you can now post to Google+? Thank you HubSpot, thank you. 3. You can monitor all of your social media channels in one place. You can check out your Twitter timeline, your mentions, your retweets, and even see how your most recent tweets are doing. It even shows you if someone liked your post or picture on Facebook. It also shows who has +1 your Google+ post or liked your latest LinkedIn post. There's really no need to log into each account separately. 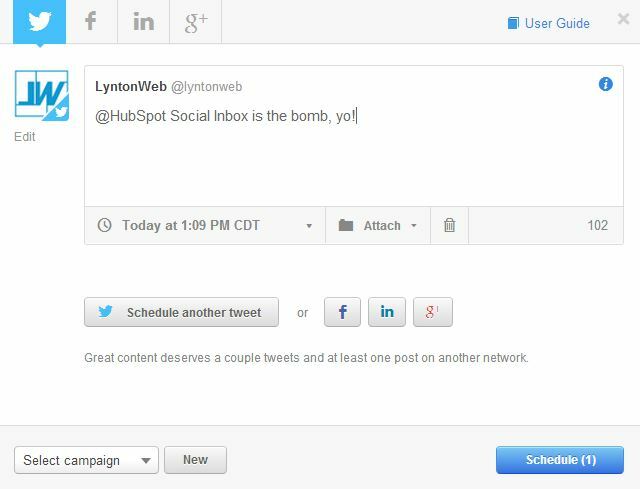 Everything you can do in those accounts, you can do in HubSpot's Social Inbox. 4. You can search for new prospects on Twitter. From within Social Inbox you can search for people and tweets matching certain keywords. It will give you a list of people and tweets as well as the number of tweets per day that are talking about that certain keyword. From there you can even create a stream to help you monitor that keyword more closely. Genius! 5. You can create custom Twitter streams. Creating custom Twitter streams is a great way to take a deeper dive into what your followers are tweeting about. It's also a great way to find other tweets that are related to your business or industry. You can include certain keywords and exclude others, and even filter it to what language and what location it comes from to reduce spam. 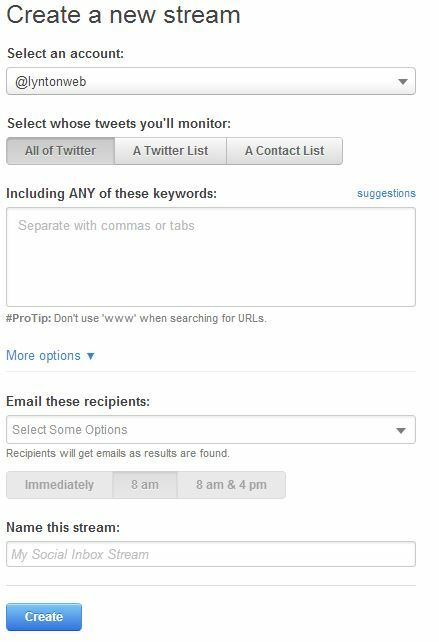 You can also monitor tweets from your own contact lists within HubSpot and even create a stream based off a certain hashtag. I recently created a Twitter stream with #Inbound14 so I can stay up to date with all the latest Inbound news! 6. You can schedule future posts to every channel. Clearly no one wants to wake up on Saturday morning to schedule posts to Facebook and Twitter. Ain't nobody got time for that! Luckily you can take some time Friday before you leave and schedule out any weekend posts. You can schedule out posts as far in advance as you would like. This is especially useful if you have a vacation coming up or your office will be closed for the holidays. Even if you have a blog post and want to schedule a tweet out once a week for 6 weeks, this is especially helpful. This is one of my favorite features of HubSpot Social Inbox. 7. You can easily see what posts are already scheduled. Obviously you don't want to schedule 10 posts in 1 day and zero posts the next. The calendar feature in the publishing box has a little blue dot for days where posts are scheduled. If you click on that day you can easily see what you are posting and to what channel. Just another way to keep your posts more organized and efficient. 8. Your analytics and growth are easily visible. The "Reach" tab in Social Inbox shows you the growth as of today's date, the growth this month, as well as the average monthly growth. You can view growth trends from the last 3, 6, and 12 months. You can even drill down into each social media channel specifically to see how that channel is performing. All without ever leaving Social Inbox. Do you find yourself opening a million tabs and logging into a million different social media channels instead of just logging into HubSpot's Social Inbox? Have you not seen the light? What can I do to change your mind? Tweet me at @lyntonweb and I'll use Social Inbox to respond to you and change your mind (insert evil laugh here).